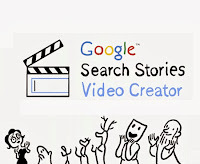 Time to use this free online video creator (Google Search Stories) to produce our very own 35 second movies. Each "Search Story" is told through a series of Google searches. Give it a go and create your own Google Search Story now.